Which way does the water flow ? 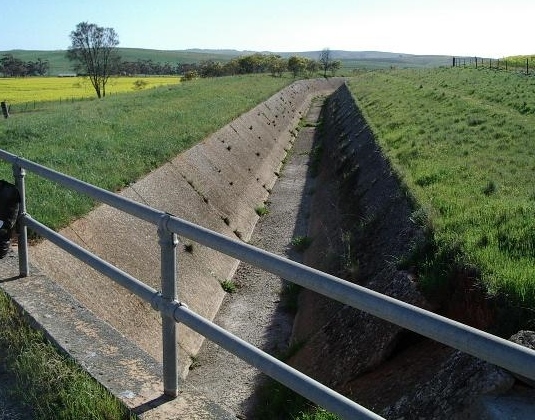 The Bundaleer Reservoir scheme, a significant piece in South Australia's engineering history heritage, is part of a modern day optical illusion that continues to baffle walkers, cyclists and tourists alike. The scheme comprises a series of channels collecting water from nearby hills, and a large Reservoir of water collected for ultimate re-distribution. However it is the direction of the flow of water through the channels that causes the most bafflement. To explain this a little further, let's take a step back through time to the 1890's when a water supply system was proposed to be built in the Bundaleer Valley to collect and ultimately provide water for the towns of Snowtown, Redhill, Brinkworth, Narridy, Port Wakefield and the Yorke Peninsula. 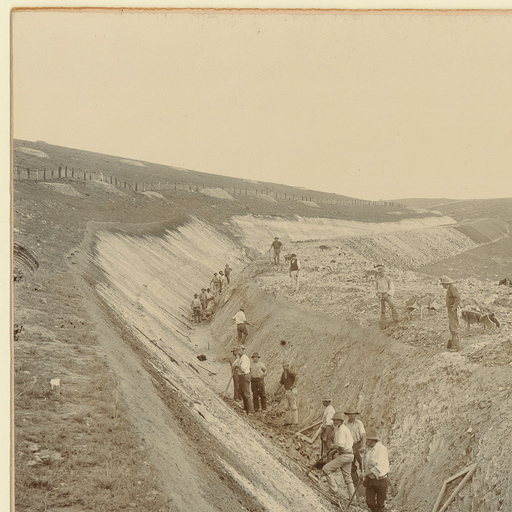 The system was to include a main earth walled reservoir just north of the junction of the Bundaleer Creek with the Broughton River. Described as "one of the seven engineering wonders of Australia", the system took almost 8 years for the final approval for construction to pass through various departments & Government, with construction finally beginning in 1898 for completion in 1902 and operations continuing until 1944 when the Morgan to Whyalla Pipeline was installed and was used to feed the 6370 Ml Reservoir. 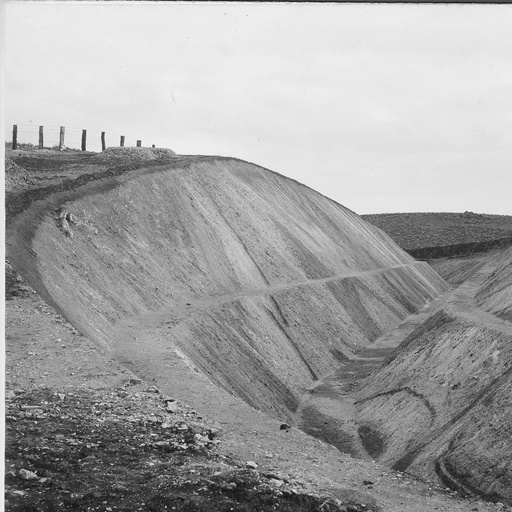 Aside from the Reservoir, the most significant feature of the system was the 30km of concrete channels which were constructed to channel and direct water into the Reservoir by gravity feed. Although slightly overgrown in parts, these concrete channels remain today as a memory of a piece of Engineering excellence and of water movements of years gone by. Today the Heysen Trail and the Mawson Trail both travel alongside the concrete channels on what is known as the Bundaleer Channel Linear Path. While walking or cycling alongside the channels, the conversation inevitably reflects on the concrete channels and heads towards determining which way does the water actually flow ? Walkers travelling in a northeast direction from Spalding are convinced that they are gradually climbing a slope up towards the Bundaleer Reservoir. Cyclists travelling southwest to Spalding also support that assertion after slowly rolling down hills. But lo and behold, in this apparent optical illusion, the water actually flows towards the Reservoir in a northeast direction. Time has seen the earth move some of concrete pieces of the Channel, and the grass has grown on the verges and in parts of the Channel thus impacting the waterflow and making it difficult to easily determine. Wind is also a factor on rainfall days as it whips along the channel in its chosen direction irrespective of the designed direction. But rest assured, having been there on one rainy day with little wind, I actually saw the water flow towards the Reservoir in the apparent uphill direction. For those wishing to see this for themselves, the Bundaleer Channel Linear Path is located 5km north of Spalding in South Australia's mid north and traverses farming land near the Goyder Highway. The main channel running parallel to the Goyder Highway is around 8km in length and (arguably) is on relatively flat terrain with a small slope. A really interesting read, Steve. What a fascinating discovery, I'd never heard of this. What a fascinating optical illusion and a great article. It's nice to be aware of the history and motivations behind 'forgotten' infrastructure such as this. Thanks Steve. What a great idea to create a huge gutter / corridor to collect water and allow gravity to feed the reservoir.